Your face greets the world, so you want it to look healthy and vibrant all the time. Unfortunately, age and time have other plans, causing wrinkles and sagging skin. 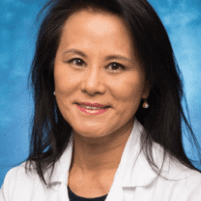 Cynthia Chao, DO, MPH, NCMP offers a noninvasive solution to combat the effects of aging: a laser system called Pellevé®. To learn more about this innovative treatment that restores a youthful appearance to your skin, call or book an appointment online. As the first line of defense between you and the world, your skin is subject to a fair amount of abuse. Over the years, this damage begins to take its toll, and you’re left with wrinkles, scars, and blemishes that mark the passage of time. These forces upon your skin are natural and mostly unavoidable, but new laser technology is available to help you turn back the hands of time. How does Pellevé help my skin? To help you achieve and maintain healthy, vibrant skin, Dr. Chao has equipped her practice with a state-of-the-art laser therapy called Pellevé, which delivers excellent results without resorting to invasive procedures. With Pellevé, Dr. Chao uses radio-frequency technology to heat the tissue under your skin without damaging the surface area. The heat destroys old skin cells and encourages your body to produce collagen to rebuild. Your body naturally eliminates the old skin cells through your lymphatic system, allowing newer, healthier cells to take their place. Dr. Chao performs the procedure at her office, and each treatment takes 45-60 minutes. Because the skin treatment is noninvasive, there’s no downtime, and you’re able to resume your normal activities afterward. When will I see results from Pellevé? Results are gradual after your Pellevé treatment, as your skin rebuilds with new collagen and eliminates old cells. Typically, patients see good results after 30 days, with the best results after 90 days. How many Pellevé treatments do I need? After your initial consultation with Dr. Chao, she sits down with you to discuss a treatment plan that meets your goals. Most patients opt for several treatments to take advantage of the collagen-building effect of laser therapy, maximizing your body’s ability to produce healthier, more vibrant skin over time. To learn how you can feel good about your skin again, call Dr. Chao or book an appointment online.